Muppets is pleased to offer a program which fosters an environment where children are safe, happy, involved and continually learning. We value learning through play to teach our students to become independent, respectful of others and develop their cognitive growth and communications. Our Program runs on Tuesdays, Wednesdays and Thursday from 9:30-11:45am for children ages 2.5-5 years of age (children must be 2.5 by September 1st). Children do not need to be toilet trained. 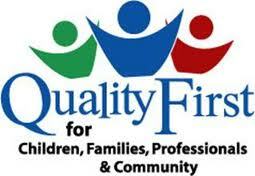 The program has a maximum of 24 children with 2 teachers and duty parents each school day. The Muppets Preschool Program is 2 ¼ hour in duration. Traditionally, the class splits into two groups on gym days when at maximum capacity. It is at the teachers’ discretion to maintain the class as a whole or split based on the needs of the children enrolled. 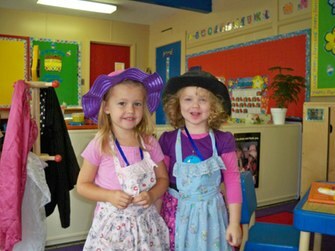 At Muppets we believe that free-play time forms the basis from which the children learn. It allows children to explore the centres (Sensory, Science, Reading, Games, Puzzles and Computer) and creative arts independently. 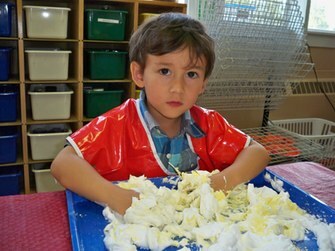 All activities are carefully planned each week with the children’s learning and developmental stages in mind. Circle Time is carefully planned by the teachers for children to gain knowledge of the world around them. This time consists of various experiences such as music/instruments, cognitive games, creative movement and stories and finger plays. In addition, activities include show and tell, letter/number of the day, current or special event discussion and social skills programming. Special guests and community outings add extra excitement to the seasons and foster an appreciation for the community in which we live. Muppets is lucky to have access to the church Gym on a regular basis. Indoor gym equipment is provided for gross motor development. When the weather permits, we enjoy exploring our neighbourhood and nearby parks. When the interest arises from the community, Muppets offers a Friday morning program to compliment the 3 day program. Circle time consists of “French Fridays” and incorporates basic French into songs, stories, and every day objects (such as food for snack time). Friday class has a smaller class size (maximum of 16 children) and preference for enrollment goes to children enrolled in the 3 morning program. Pricing is $100 per month in addition to the 3 morning fee. Volunteers and/or duty parents are needed depending on the class size. Please specify on the first page of the Registration form of wanting to participate in the Friday program.